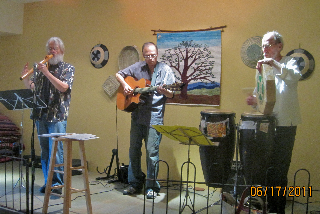 “STREETBEETS” left to right: Jerry Miller on harmonica and Native American flute, Marty Dutcher on guitar, and Paul Montigny on drums will perform at ALLEN MILLER ARTS, Music Friday, July 15, starting at 6:00 pm. 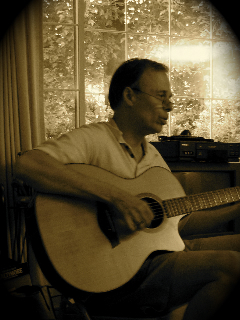 During an Open Mic period others will be invited to perform music, poetry, drama etc. 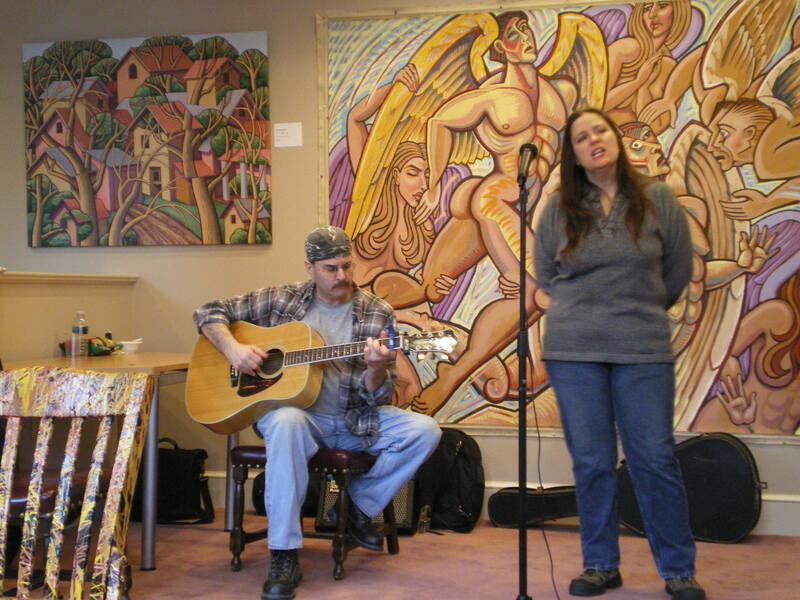 Wendy and Dave Wesselhoft performed "She Talks to Angels" and other moving numbers at the ALLEN MILLER ARTS "Open Mic Art Night," Friday, April 15th, 2011, in front of a backdrop of paintings by Kevin Miller. The event was a big success and will now be offered every First and Third Friday, 6-9 pm at the gallery: 117 E Chestnut St, Lancaster, PA 17602. For more information call 717-927-9405 or 215-837-8171 during gallery hours. 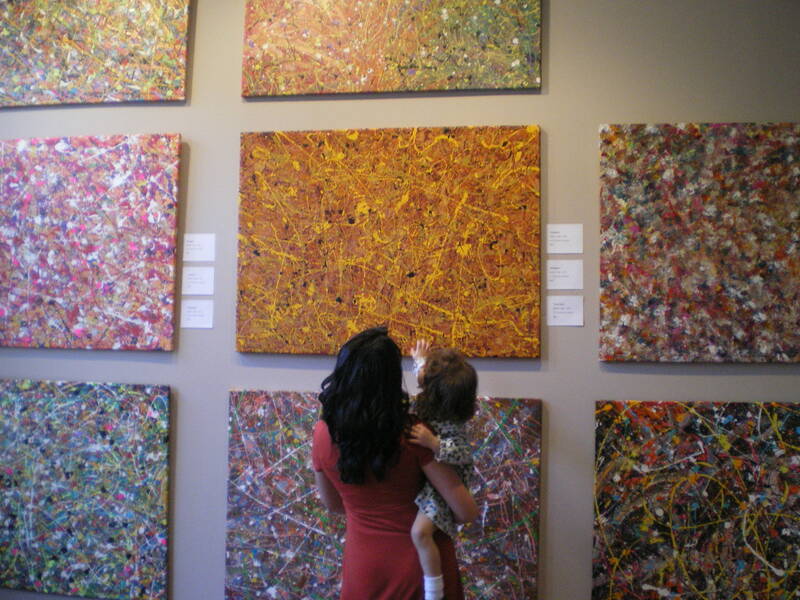 Enthusiastic singer and dancer Viviana Arnold and her mom, Jen, took time to appreciate the richly textured canvases of Robert Allen at the ALLEN MILLER ARTS “Open Mic Art Night,” Friday April 15th, 2011. 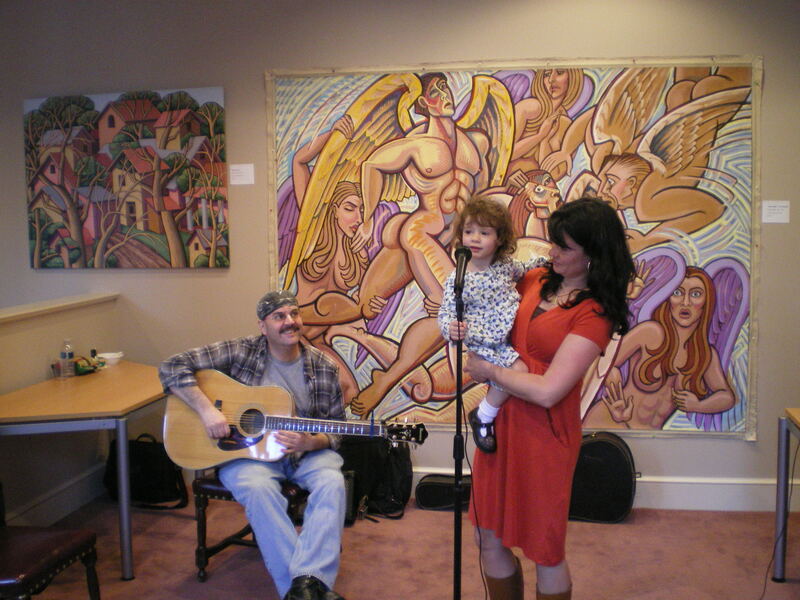 Our youngest performer, Viviana Arnold, 2 1/2 years old, captivated the audience with her riveting rendition of “Twinkle, Twinkle Little Star,” and her own unique arrangement of “The Alphabet Song.” She is supported here by her mom, Jen Arnold, and accompanied by guitarist Dave Wesselhoft, against a backdrop of paintings by Kevin Miller. ALLEN MILLER ARTS — our new center city Lancaster gallery — is featured on the cover of today’s Arts & Entertainment Section of the Lancaster Intelligencer Journal / New Era. You can see the article by clicking on this highlighted address — http://articles.lancasteronline.com/local/4/372492 . There is a photo box at the top of the article. Click on the side arrows to see more art in our new gallery. 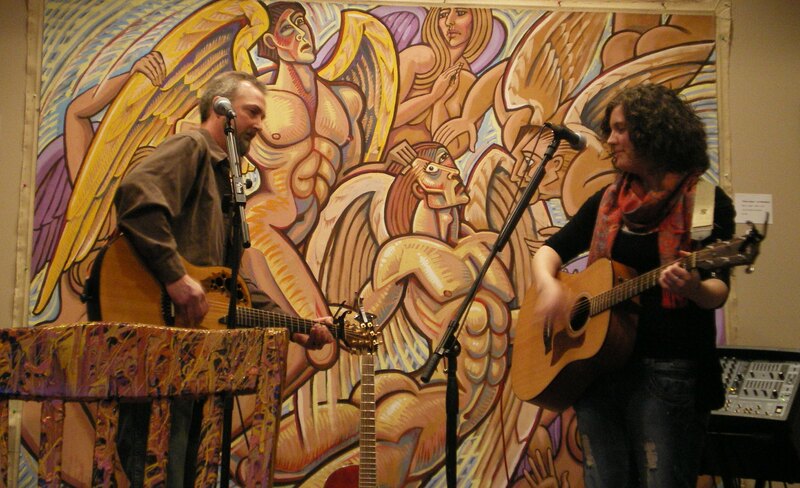 “OPEN MIC ART NIGHT’ is every Third Friday, starting April 15! On First and Third Friday’s our hours are extended from noon to 9 pm. 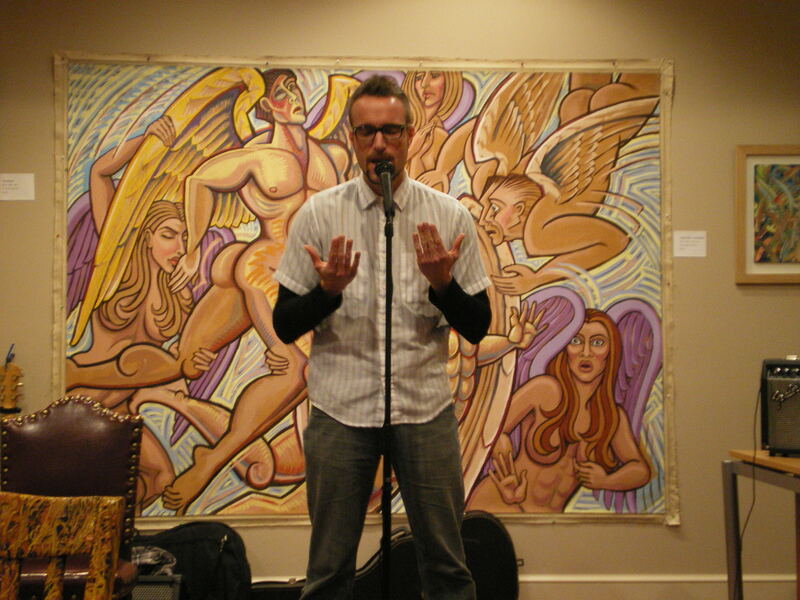 Come for Wine and Snacks Happy Hour and stay to enjoy everyone’s creative contributions from 6 to 9pm on “Open Mic Art Nights.” Musicians, poets, actors, dancers, writers, painters, sculptors, crafters and creatives of all stripes are encouraged to perform or share their art. HOURS: Tues, Fri, Sat — noon to 6pm (noon to 9pm 1st & 3rd Fridays.) The gallery will be open noon to 9pm Fri/Sat April 15 & 16. 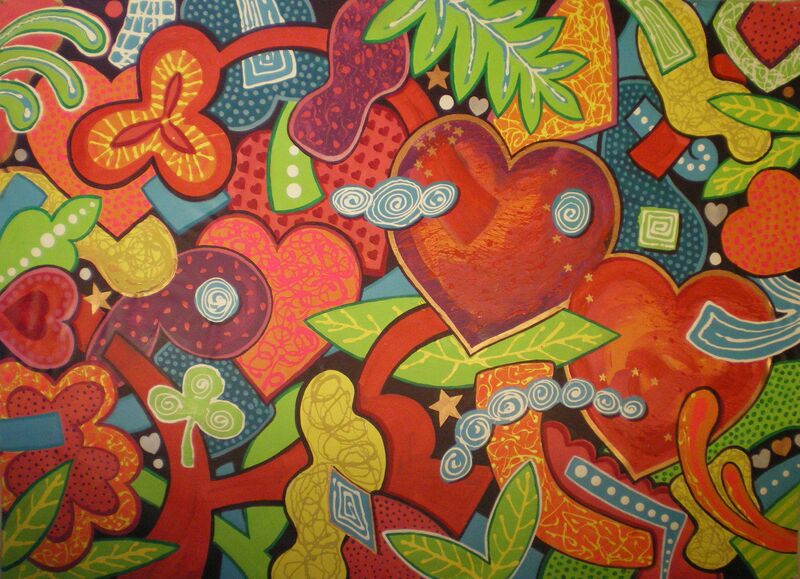 Thirty exuberant paintings by Robert Allen will be featured at the Grand Opening of Allen Miller Arts. 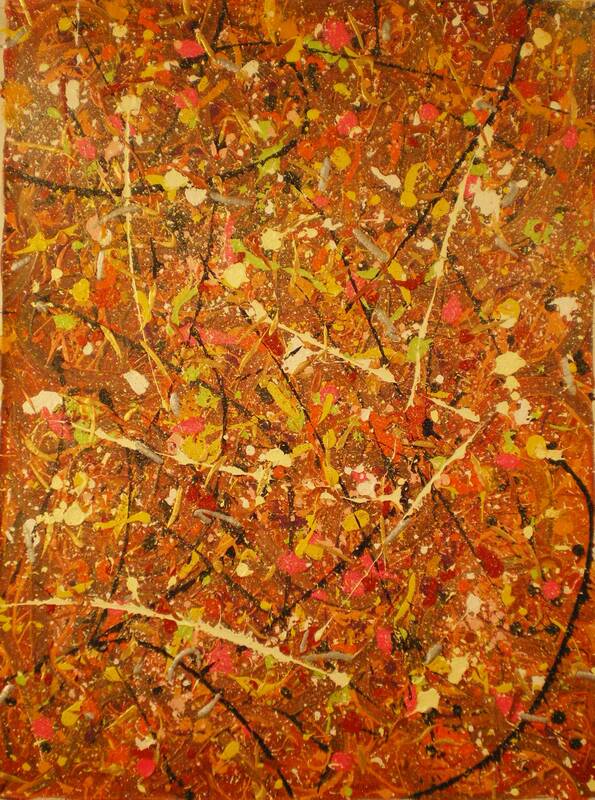 Robert’s 3 ft x 4 ft canvases are inspired by the paintings of Jackson Pollock and the contemporary glass designs and paintings of Dale Chihuly. 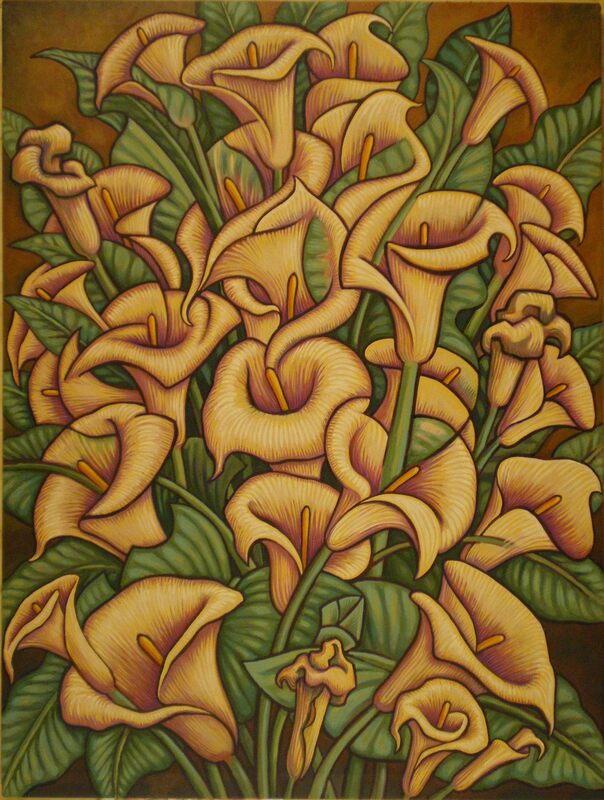 "Calla Lily Garden" is a recent 3 ft x 4 ft oil painting on canvas by Kevin Miller. 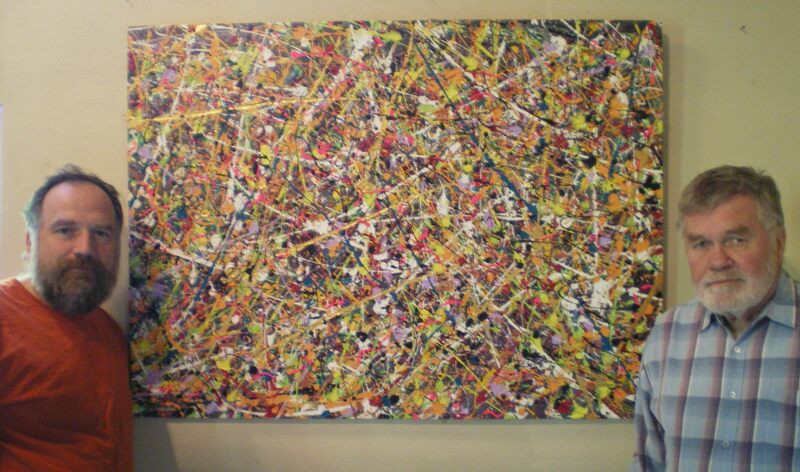 It will be exhibited for the first time at the Grand Opening of Allen Miller Arts, April 1 & 2, noon - 9 pm. Friday, April 1st is “FIRST FRIDAY” in Lancaster. 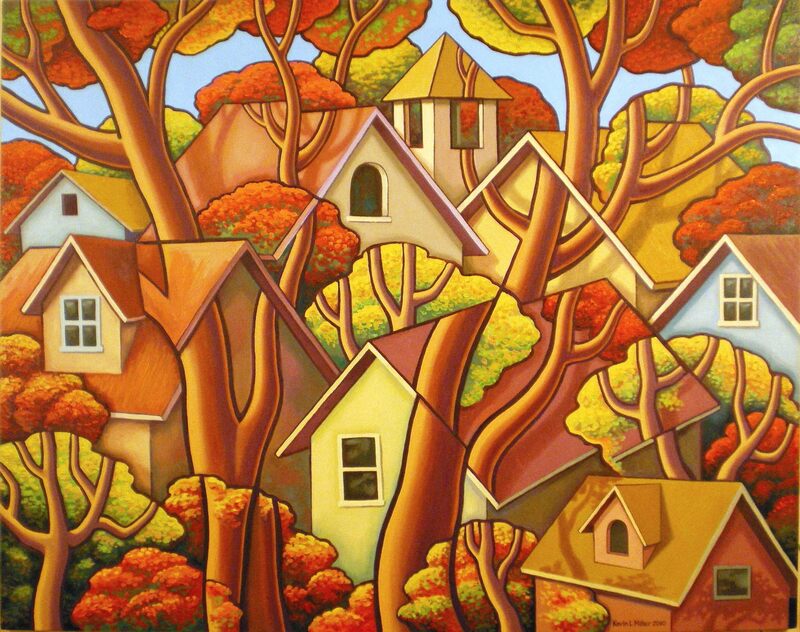 Visit the Grand Opening of Allen Miller Arts and see Gallery Row just a few blocks west. 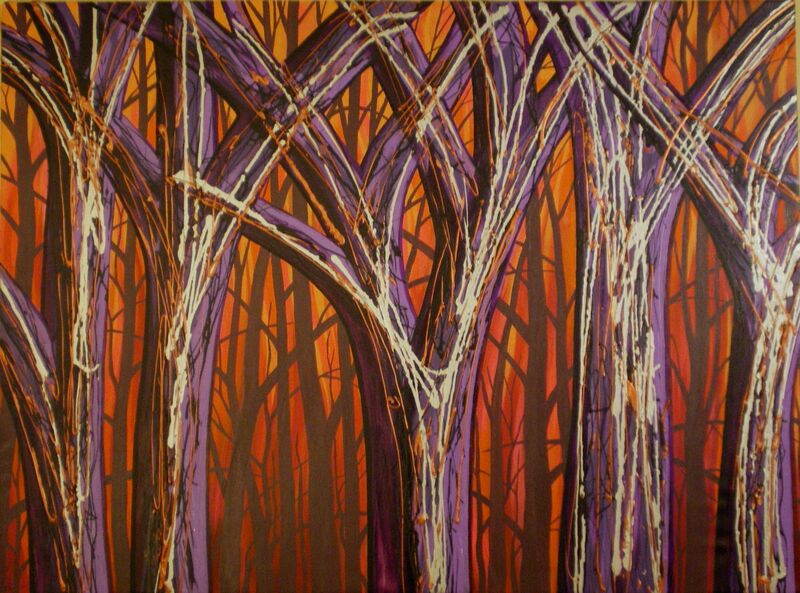 "Deep Woods" is a 3 ft x 4 ft collaborative canvas completed by both Robert Allen and Kevin Miller just weeks ago. 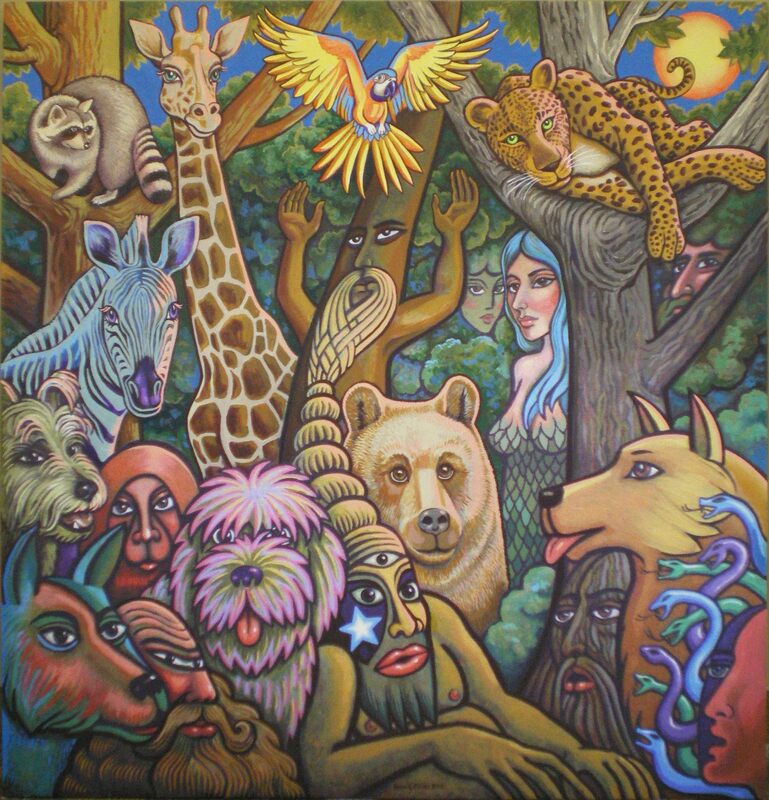 Several of these 2-artist paintings, signed "Allen Miller" will be exhibited at the Grand Opening of Allen Miller Arts. 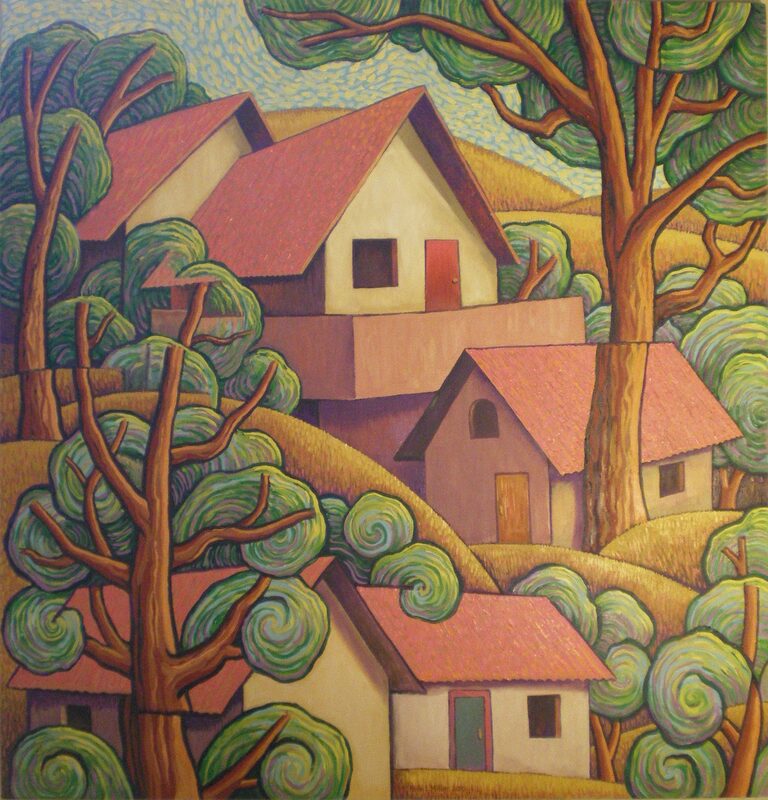 This painting features highly expressive and textured foreground trees contributed by Robert, and muted background trees on a brilliant sky added by Kevin. 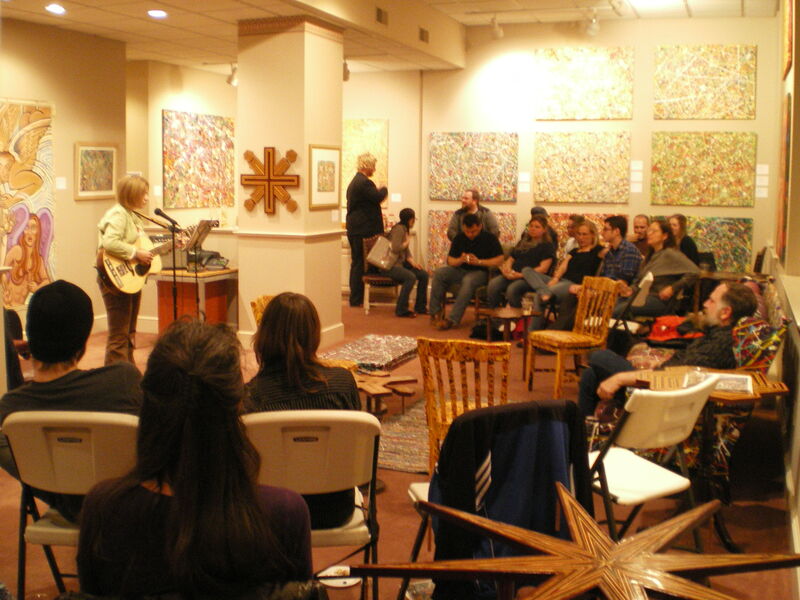 “OPEN MIC ART EVENING” Saturday, April 2nd, 6 – 9 pm: During “Open Mic Art Evening” at the gallery, poets, dancers, musicians, actors, storytellers, painters, sculptors, writers, fabric artists, botanical designers, woodworkers, and other creatives are invited to perform or show their art. Others are welcome to be audience participants! Please bring your creative talents and efforts to share. 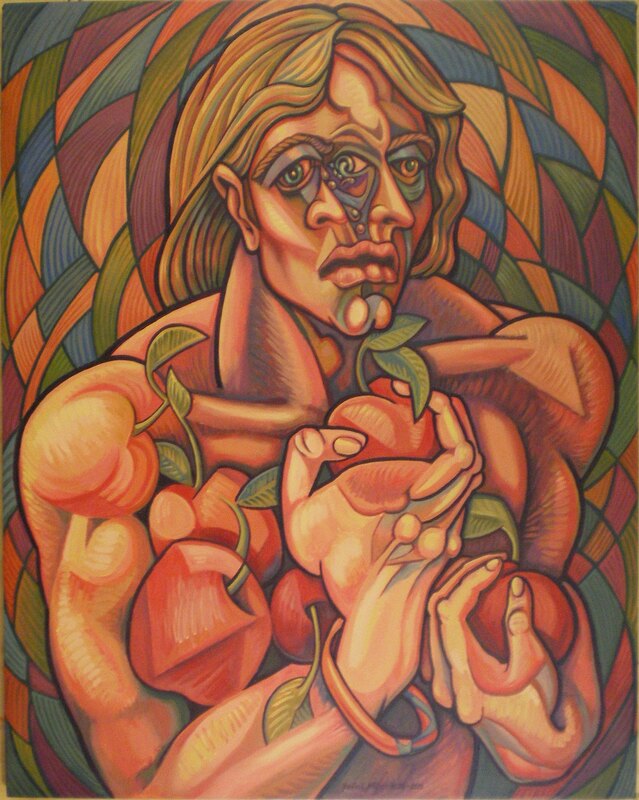 "Apple Man" is a recent 3 ft x 4 ft oil painting on canvas by Kevin Miller, based on a sketch he created in 1970 while studying at the Ecole des Beaux Arts in Aix-en-Provence, France. April is Fundraiser Month for Manheim Township Public Library: Mention that you are a supporter of the new library when you buy any item in the gallery during the April MTPL Fundraiser, and Allen Miller Arts will donate 20% of your purchase amount to the library. Robert Allen & Kevin Miller are now working hard to open a large new art gallery to show their art and benefit local, regional, and national charities and nonprofits. The Grand Opening of Allen Miller Arts at 117 E Chestnut (at Duke,) Lancaster, PA, is planned for April Fools’ Weekend, the 1st and 2nd. Allen and Miller readily admit to being total fools for art, and are painting like madmen to prepare for the event, which will be a fundraiser for the Manheim Township Public Library throughout the month of April. 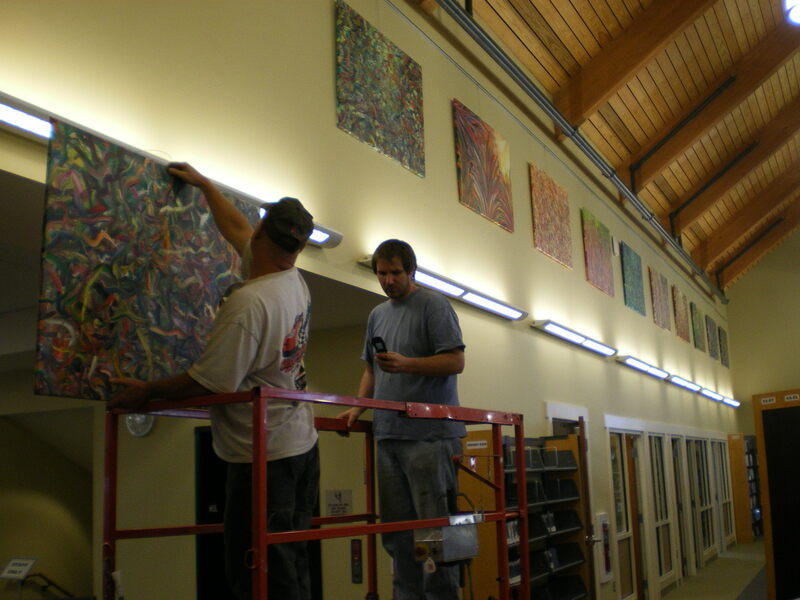 Eleven 3ft x 4ft Robert Allen canvases were installed in one long row on the second story at the new Manheim Township Public Library, in preparation for opening receptions Sept 12, 2010, attended by 300 library donors and friends of the 13 artists exhibited. 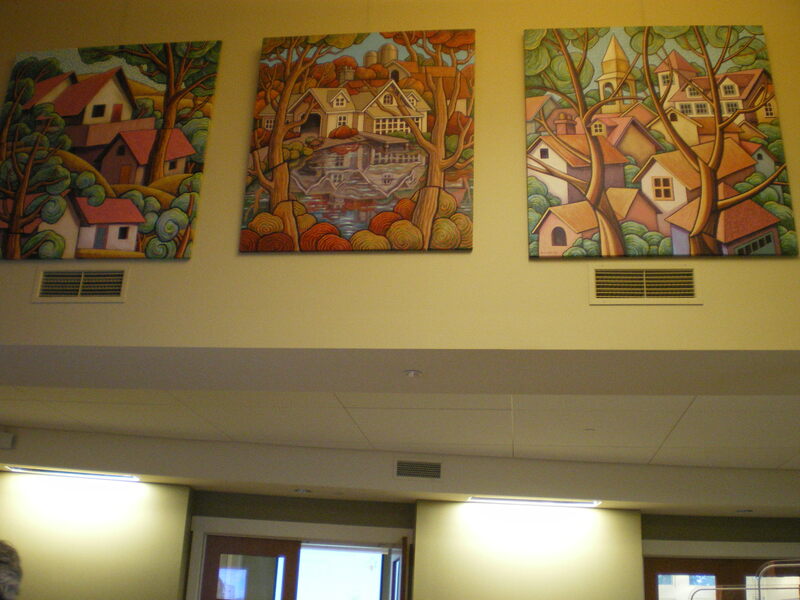 Four of Kevin Miller’s 4ft x 4ft Provence Style paintings hang in the second story vault over the reception desk in the foyer of the new library. Shown in this photo left to right: “San Clemente Summer” is based loosely on Kevin’s former neighborhood overlooking the Pacific Ocean. 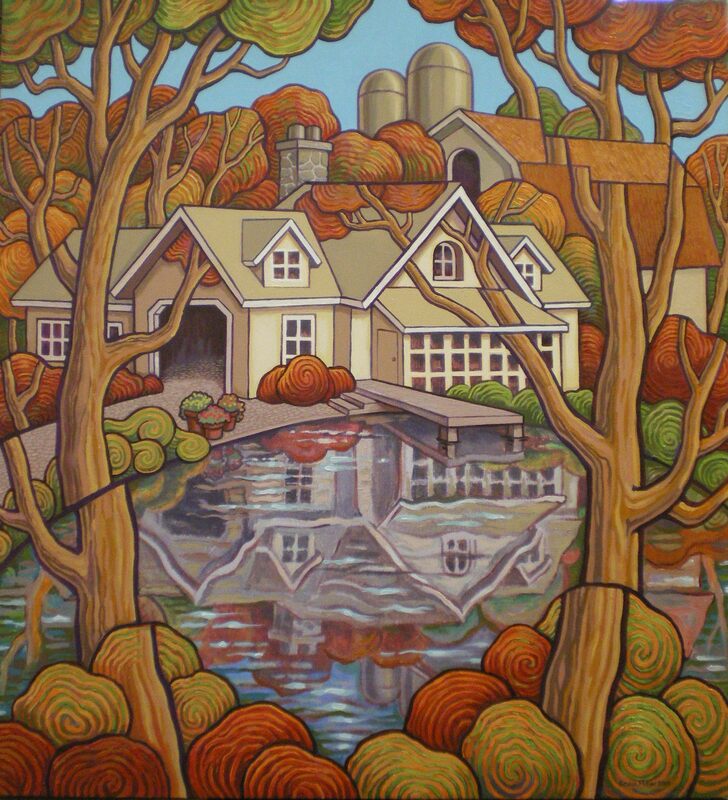 “Autumn Reflection” draws inspiration from many Pennsylvania farm ponds and scenes near the artists’ current woodland studio deep in Amish farm country. 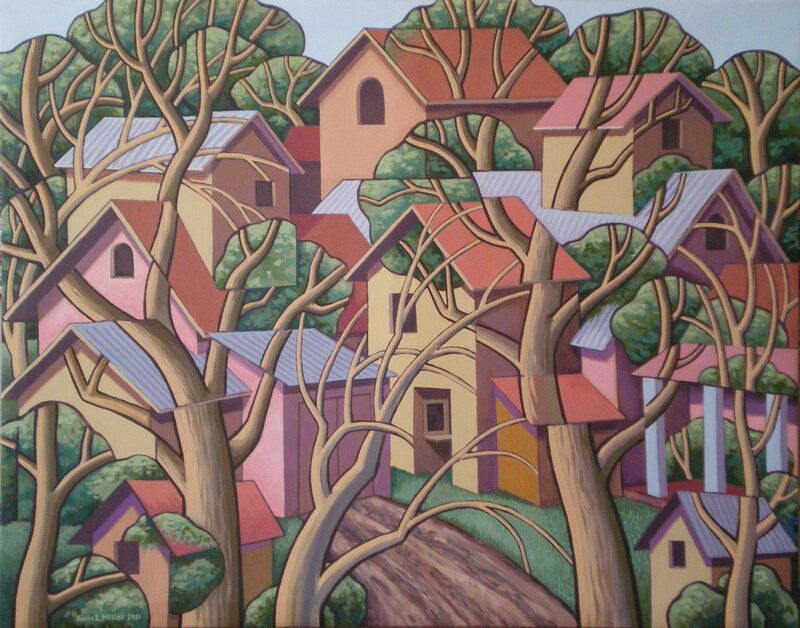 “The Old College Town” depicts everyone’s rose-colored memories of those years. 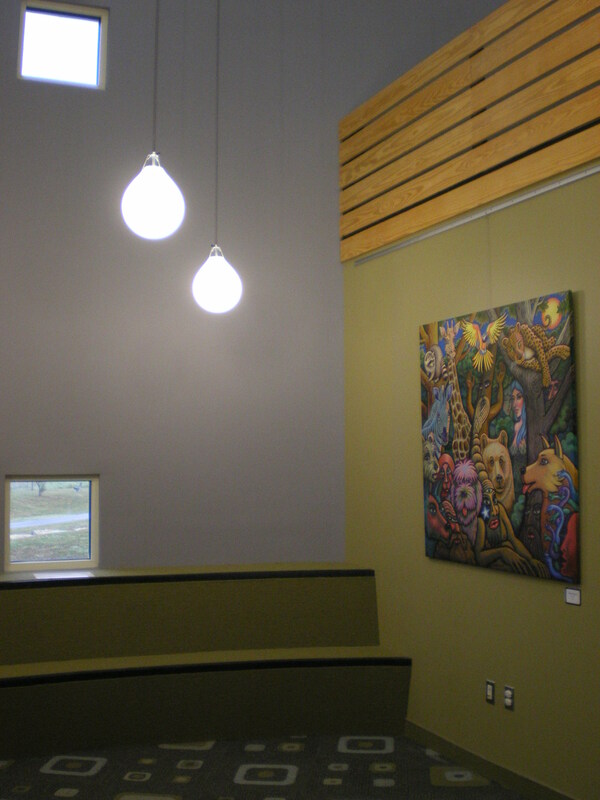 Kevin Miller’s 4ft x 4ft acrylic on canvas, “Woodland Spirits” seems right at home in “The Silo” — a round reading room that is just one small part of the spectacular children’s library in this exciting new architecture. 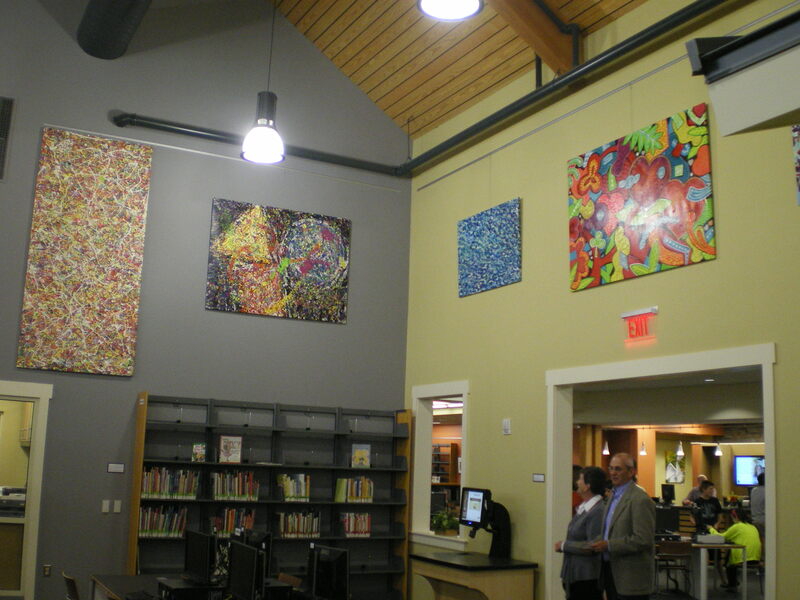 The inaugural art exhibit at the new Manheim Township Public Library continues through Oct 31 with Gala Opening festivities for the library starting at 10:00 a.m. Saturday, Oct 16 and continuing throughout the day, culminating in a large formal banquet and silent art auction that evening for library supporters. Look up as you enter the library. 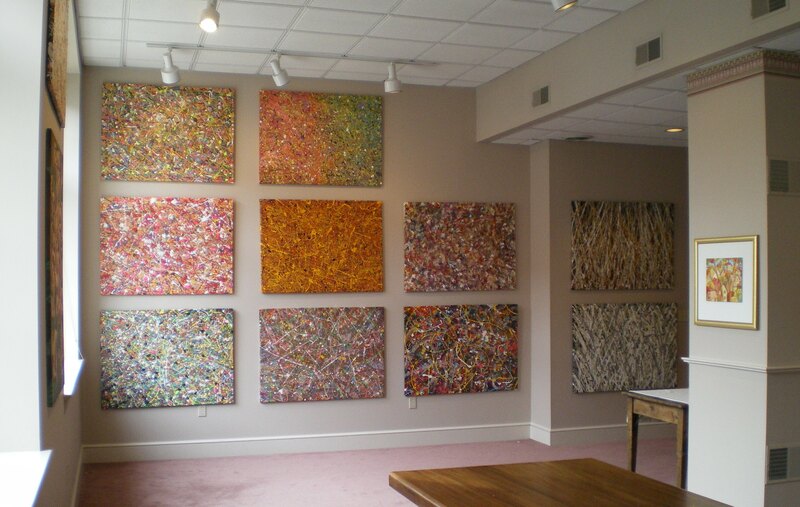 Four of Kevin Miller’s 4ft x 4ft Provence Style oil landscapes on canvas hang in the 2nd story vault directly over the reception desk. 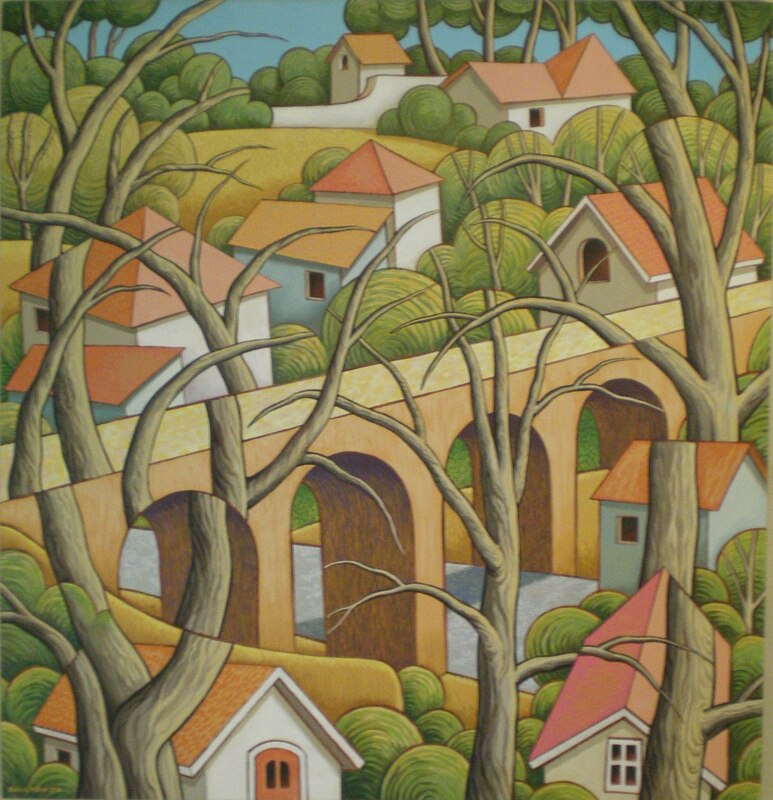 Shown here on the left is “Return to Provence,” based on a pencil sketch made by the artist in a field outside Aix-en-Provence, France in 1969. This is the third time he has painted this scene, and he says he hopes to get it right some day. 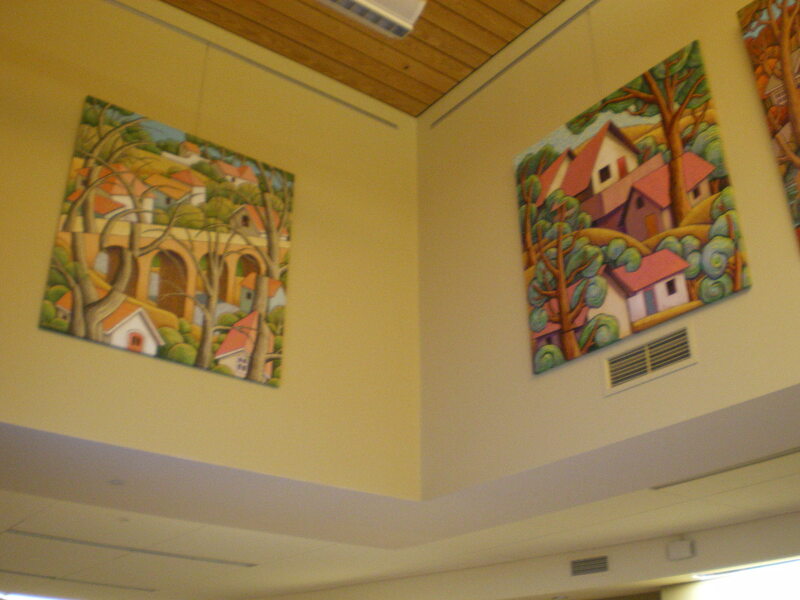 On the right is “San Clemente Summer,” loosely based on the artist’s former neighborhood overlooking the Pacific Ocean in Southern California. Today was the first of two days of intense work by many people to install 100 paintings in the inaugural group art exhibit at the beautiful new Manheim Township Public Library, which looks for all the world like a cutting edge new contemporary art museum just north of Lancaster, PA. I have been working on the two paintings above for much of the summer, along with many others. I arose at 3am yesterday to finish “Autumn Reflections,” a 4 x 4 ft oil on canvas in my “Provence Style.” And I was up again at 3am this morning to finish “Woodland Spirits,” a 4×4 ft acrylic on canvas in my “Fantasy Style.” Robert Allen and I have been working intensely all summer to be ready for this installation day at the library. We signed, stretched, listed and loaded 60 large new canvases in our rented trailer and pulled out of Sawmill Run in Robert’s big honkin’ Dodge ram pick-up truck at noon. Tomorrow we will leave for the second day of installation at 7:30 am. It is looking good. I am proud that they chose my four big “Provence Style” landscapes to display in the entry hall of the new library. We hope to have good crowds for the Donors’ Reception and the Artists’ Reception on Sunday, Sept 12, 3-6pm and 7-9 pm. I am painting 14 hours a day to finish all the large canvases I started earlier this summer in preparation for installing a museum-scale art exhibit at the new Manheim Township Public Library, just north of Lancaster, PA, in less than a week. You are welcome to attend the Artists’ Reception Sunday, Sept 12, 7-9pm for Robert Allen and me and 12 other artists from this region. Robert and I will exhibit about 50 of our new canvases — his work, mine, and our 2-artist canvases, some of which you can see below. 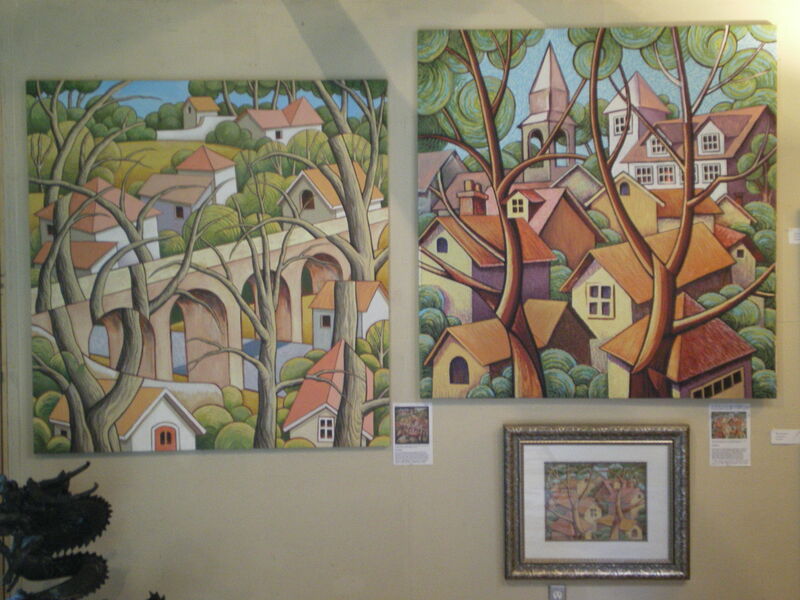 Above are two oil paintings in my “Provence Style,” completed in the last few days. The first one, “Return to Provence,” is based on a pencil sketch I made while sitting on a hillside in the country outside Aix-en-Provence, France, where I was studying at the Ecole des Beaux Arts 41 years ago. I have painted this landscape three times. Some day I’ll get it right… The second canvas, “San Clemente Summer,” is loosely based on the Southern California home I owned over 15 years ago, overlooking the Pacific Ocean at Dana Point Harbor. The hills always turned golden ochre in the summer. These paintings are influenced by Picasso and Van Gogh and Cezanne who lived and worked in the hills around Aix-en-Provence. 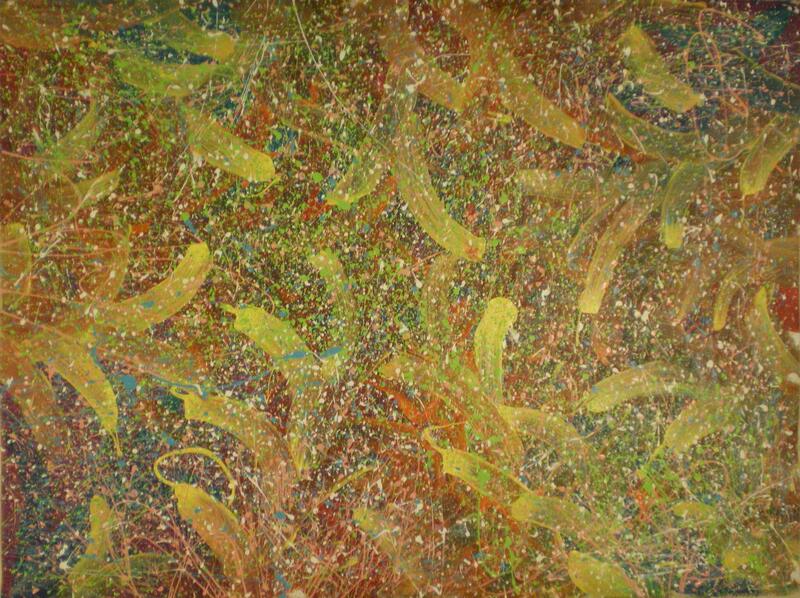 Robert Allen and Kevin Miller will show 100 recent large paintings at Sawmill Barn Art Gallery in South Central PA Aug 29 to Sept 6, with an Open House from noon to 6pm, Sunday Aug 29. The two artists will each show their own canvases as well as many paintings that are two-artist collaborations, signed Allen Miller. Visitors will see 40 recent canvases at the new house under construction at “The Cliffs” portion of the property and 60 large new paintings in the Sawmill Barn Art Gallery on “The Ponds” section of the acreage, where they can also feed the 90 koi in the half-acre pond and have a glass of wine or soda in the pavilion or on the tree house deck..
Below are some examples of recent large paintings shown in the 2-man exhibit.